​​"THE EUROPEAN SCHOOL OF MUSIC PLAYED AN INTEGRAL ROLE IN MY DEVELOPMENT AS A MUSICIAN. I WOULD NOT BE WHERE I AM TODAY WITHOUT THEIR TEACHING, MENTORSHIP, AND PATIENCE." ​Handing down a special touch which makes the instrument sing. Developing, with practice, a response ... a feel .. a relationship with the instrument ... until the music becomes part of you, and you become part of the music. 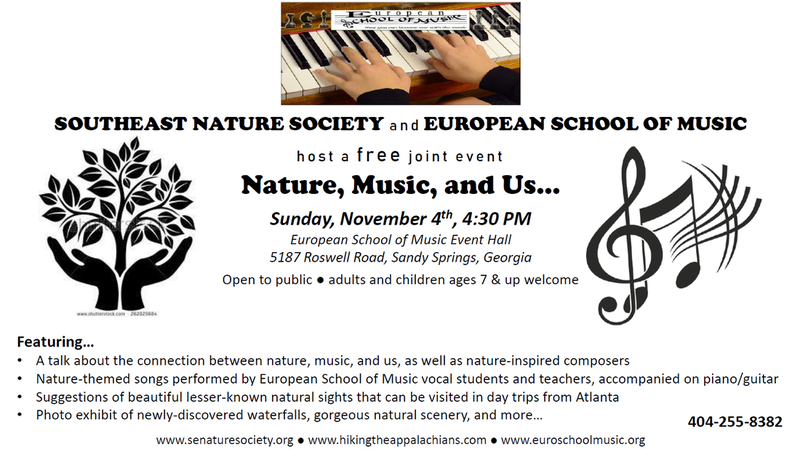 ​The European School of Music, in conjunction with the Southeast Nature Society, will host a unique event, Music, Nature and Us, taking place at the school’s event hall at 5187 Roswell Road in Sandy Springs Nov. 4 at 4:30 p.m. It is free and open to the public for adults and children 7 and older. It will feature a talk about the connection between nature, music and human beings, as well as nature-inspired composers. Nature-themed songs will be performed by the school’s vocal students and teachers, accompanied on piano and guitar. There will be suggestions of beautiful lesser-known natural sights that can be visited in day trips from Atlanta as well as a photo exhibit of newly discovered waterfalls and gorgeous natural scenery. ​"The school taught me about the meaning behind each song, the emotions in it, not just the notes ... everything that I've learned at the school will stay with me forever." ​There's more to playing an instrument than learning the notes. It's also about understanding and truly feeling the music. This simple, yet unique teaching philosophy has quickly launched the European School of Music into the spotlight among top music schools in the Southeast. ​The European School of Music offers course of study for children (5 years and older) and adults, both beginning and advanced. Instructors tailor the educational experience to meet individual needs, whether a student is preparing for entrance to a highly competitive conservatory or taking lessons for pure pleasure and relaxation. My son, Daniel began taking piano lessons when he reached 5. He had a wonderful teacher and supportive family members. He learned that keeping up with practice was easier than catching up and even with an active sports life and serious homework, he not only stuck with it but grew from learning to play the piano. He will tell you that it helped him in school and playing classical, jazz and rock didn't hurt his social life either. Giving Daniel the opportunity to learn to play the piano at The European School of Music and Chess (he also took chess lessons and liked that as well) was the greatest gift I could have given him. Great school!! Website designed by Mark Oleg, a 17-year old European School of Music student.